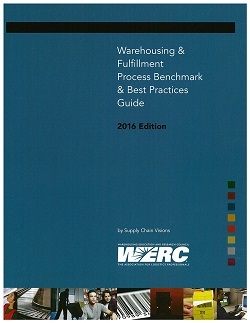 Completely updated from end-to-end to more accurately reflect the way today’s warehousing and distribution centers function in the e-commerce and omni-channel fulfillment age, the 2016 Edition of the WERC Warehousing & Fulfillment Process Benchmarking & Best Practices Guide is now available for purchase. Why do you need the most up-to-date version of the Best Practices Guide? Because today’s warehouse managers must understand both qualitative and quantitative metrics as they relate to performance improvement. In other words, move beyond the numbers and focus on their processes. The 2016 Edition is the only resource that provides a tool that can be used to benchmark warehousing operations against a proven set of industry standards. In other words, it helps you determine if the work your warehouse associates tackle daily supports your organization’s mission, vision, values, and long-term goals. Complete and easy-to-follow instructions for benchmarking of internal operational practices, a process that has been validated by more than 100 auditor site visits and certifications. A comprehensive guide to current best-in-class warehousing practices across those eight functional areas (expanded with 50 process groups and 117 attributes) of best practices currently in use by others, and steps to craft your own practice improvement roadmap. Worksheets identifying specific key performance indicators (KPIs) for practice functions based on WERC’s DC Measures Study, and instructions for dealing with exceptions in your specific operations. Use it to complete your overall performance improvement program for maximum benefit. Email wercoffice@werc.org or call 630.990.0001.